Farajzadeh, Mohammad Ghasem, Tayarany, Ali, Hosseini Sani, Seyed Kamal. (1396). An Efficient Method for Controlling of CML Treatment System. مجله علمی-پژوهشی رایانش نرم و فناوری اطلاعات, 5(1), 53-61. Mohammad Ghasem Farajzadeh; Ali Tayarany; Seyed Kamal Hosseini Sani. "An Efficient Method for Controlling of CML Treatment System". مجله علمی-پژوهشی رایانش نرم و فناوری اطلاعات, 5, 1, 1396, 53-61. Farajzadeh, Mohammad Ghasem, Tayarany, Ali, Hosseini Sani, Seyed Kamal. (1396). 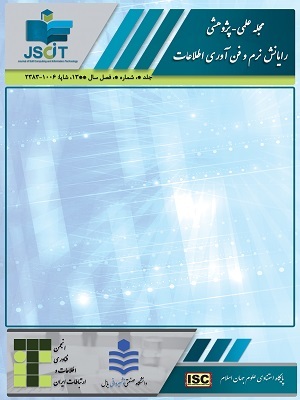 'An Efficient Method for Controlling of CML Treatment System', مجله علمی-پژوهشی رایانش نرم و فناوری اطلاعات, 5(1), pp. 53-61. Farajzadeh, Mohammad Ghasem, Tayarany, Ali, Hosseini Sani, Seyed Kamal. An Efficient Method for Controlling of CML Treatment System. مجله علمی-پژوهشی رایانش نرم و فناوری اطلاعات, 1396; 5(1): 53-61. Chronic myelogenous leukemia (CML) is a kind of blood cancer, which produces abnormal white blood cells uncontrollably. Modeling of this type of disease can help for treatment of it to physicians. In this paper we proposed an efficient method for CML treatment. In this method, a nonlinear multivariable system is considered as the plant of the CML treatment. Then an efficient centralized multi-input multi-output proportional and integral (CMIMOPI) controller is proposed for this system. Results show that proposed CMIMOPI controller can control CML disease well, by using low dosage of drugs. Although the real plant is nonlinear, however the controller has good robustness and can stabilize the system for various conditions. Simulation results show that the steady state population of cancer cells at the end of treatment period is highly reduced and the rate of cancer improvement is independent from reproduction of cancer cells. H. Moore and N. K, LI., "A mathematical model for chronic myelogenous leukemia (CML) and T cell interaction," Theoretical Biology vol. 227, pp. 513-523, 2004. R. Padhi and M. Kothari, "An optimal dynamic inversion-based neuro-adaptive approach for treatment of chronic myelogenous leukemia," computer methods and programs in biomedicine, vol. 87, pp. 208-224, 2007. Paula, Chronic Myeloid Leukemia Booklet: The Leukemia & Lymphoma Society, revised in 2012. C. V. Cotta and C. E. Bueso-Ramos, "New insights into the pathobiology and treatment of chronic myelogenous leukemia," Annals of Diagnostic Pathology vol. 11, pp. 68, 2007. M. Baccarani and et.al., " Imatinib and pegylated human recombinant interferon-alpha2b in early chronic-phase chronic myeloid leukemia," The American Society of Hematology, vol. Blood 104 (13), pp. 4245-4251, 2004. T. Thiesing and et.al., ", Efficacy of STI571, an Abl tyrosine kinase inhibitor, in conjunction with other antileukemic agents against Bcr-Ablpositive cells," The American Society of Hematology, vol. Blood 96 pp. 3195-3199, 2000. "The Scott Hamilton CARES Initiative," http://www.chemocare.com/bio/cytarabine.asp, 17.9.2012. S. P. Chakrabarty and F. B. Hanson, "Optimal control of drug delivery to brain tumors for a distributed parameters model," presented at Proceedings of the American Control Conference 2005. K. R. Fister and J. C. Panetta, "Optimal control applied to cell-cycle-specific cancer chemotherapy," SIAM J. Appl.Math, vol. 60, pp. 1059-1072, 2000. U. Ledzewicz and H. Schattler, "Analysis of a cell cycle specific model for cancer chemotherapy," Biol. Syst, vol. 10, pp. 183, 2002. Thomas-Schoemann, Audrey, and e. al., "Drug interactions with solid tumour-targeted therapies," Critical Reviews in Oncology/Hematology, vol. 89, pp. 179-196, 2013. Oliveira, Sabrina, and e. al., "Targeting tumors with nanobodies for cancer imaging and therapy," Journal of Controlled Release, vol. 172, pp. 607-617, 2013. Yin, Qi, and e. al., "Reversal of multidrug resistance by stimuli-responsive drug delivery systems for therapy of tumor," Advanced drug delivery reviews, vol. 65, pp. 1699-1715, 2013. K. Takara, et al., "Size-controlled, dual-ligand modified liposomes that target the tumor vasculature show promise for use in drug-resistant cancer therapy," Journal of Controlled Release, vol. 162, pp. 225-232, 2012. M. C. Mackey and L. Pujo-Menjouet, "Contribution to the study of periodic chronic myelogenous leukemia," C. R. Biol. 327 vol. 3, pp. 235-244, 2004. F. Michor and et.al., "Dynamics of chronic myeloid leukemia," Nature vol. 435, pp. 1267-1270, 2005. S. Nanda, H. Moore, and S. Lenhart, "Optimal control of treatment in a mathematical model of chronic myelogenous Leukemia," Mathematical Biosciences vol. 210, pp. 143-156, 2007. B. Aïnseba and C. Benosman, "Optimal control for resistance and suboptimal response in CML," Mathematical Biosciences, vol. 227, pp. 81–93, 2010. R. Borrelli and C. Coleman, Differential Equations: A Modeling Perspective. New York: Wiley, 1998. J. M. Maciejowski, Multivariable Feedback Design: Addison – Wesley, 1989. M. Green and D. N. Limebeer, Linear robust control: Prentice – Hall, 1995. A. Khaki Sedigh, Analysis and Design of Multivariable Control Systems. Tehran: Khajenasir, 2010. S. Skogestad and I. Postlethwaite, Multivariable Feedback Control Analysis and Design, Second ed: Wiley, 2005. Q. G. Wang, C. Ye, N. Jaci, and C. C. Hang, "PID Control for Multivariable Processes," LNCIS, Springer Verlag, 2008. D. H. Owens, "Feedback and Multivariable Systems," IEEE Control engineering series, 1978. R. V. Patel, Multivariable System Theory and Design: Pergamon press, 1982. V. V. Kulkarni, M. V. Kothare, and M. G. Safonov, "Decentralized dynamic nonlinear controllers to minimize transmit power in cellular networks, Part I," Systems & Control Letters, 2010.